12.02.2018 Rentner Graffiti Part 6. Still love writing my name! Gold Block Edition. Thanks for this day to Forty3 and the rest of the Boys: Jubie, Heis, Iggy, Koolski and Nasko. 10.02.2017 An Aussie friend found this 16 years old Rebelzer works in the middle of the Outback... the friendly freaks and an Rebelzer Piece. Still there since 1999. Thanks for the Photos Bro! 11.10.2017 Rentner Graffiti Part 5. Hafen Hamburg. Props to my man: Forty3, Razzle Dazzle Dissel Chissel. Just a Test. 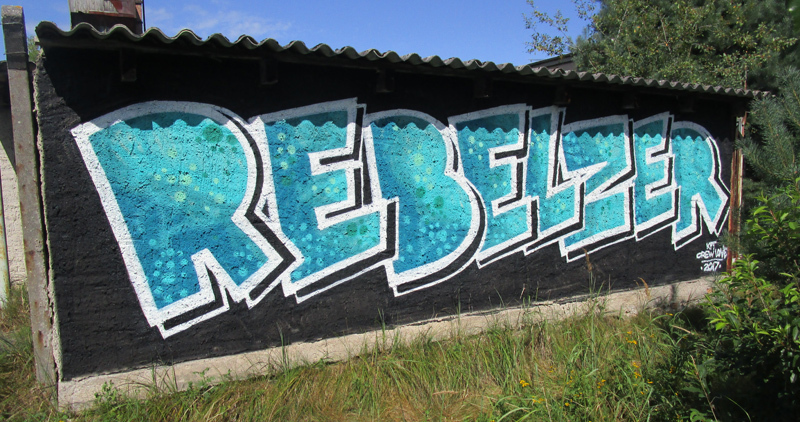 08.08.2017 Rebelzer East Germany - KPT Hammercamp 6.0 Crew love is true love! 25.07.2017 Rentner Graffiti Part 4. Hafen Hamburg. Props to Forty3, Simo, Ismilealot, Fortress, Heizzz, Jubie, Deos, Seemsoe and Nasko! 22.07.2017 Estepona Graffiti Wall of fame. 14.05.2017 Rentner Graffiti Part 3. Same Dude - same Freaks: Rebelzer and Forty 3. Yeah. 30.09.2016 At a nice wall in Luzern / Swiss. Together with Queenkong.10 years in love ! 18.09.2016 Drunken Rentner Graffiti with a lot of good friends. Habour Hamburg. Thanks for the great day boys !